Compared to standard high tensile fence wire, this 12½ gauge plastic coated wire is more attractive, safer and more visible. This wire costs about 12.5¢ per foot, (63¢ per foot for 5 lines) and can be installed with up to 50 foot post spacings when electric wire is also used on the fence. Kencote high-tensile core is Class 3 galvanized (zinc coated) for an expected life of 30 to 60 years. Hotcote adds electric, visibility, safety, and good looks to any fence. It is made with our high strength 210,000 PSI, Class 3 Galvanized, 12.5 gauge wire as the core. Overall thickness is about .3", making it the most visible coated wire on the market. The lifetime of coated wire products is increased by adding electric. The electric keeps animals from working against the fence, wearing the plastic at points of attachment. At 13¢ per foot, this high-visibility wire is a safer alternative to smooth high-tensile wire. 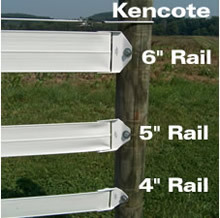 Horse Rail 4", 5", or 6"
Horserail is available in white, black and brown and in widths of 4", 5" and 6". The flexibility, smoothness and strength of this rail not only protects the horse and rider from injuries caused by conventional railing, but also provides a long lasting, attractive rail that requires little maintenance. Poplar Board Fence is ideal if you want a rustic wood fence look. It is easy to install and repair. Drawbacks are the high costs of wood products which make up most of the fence materials. Life expectancy is not as long as other fence types but using an offset electric wire to prevent cribbing may extend the life. With a three rail fence cost can be 50¢ per foot of rail. ($1.50 per foot for three rail). This fence is easier and quicker to build than many systems because the 1½" wide electric tape is tensioned by hand (no special tools needed). End posts do not have to be super strong. The tape has high visibility and it is hard for horses to get injured if they become entangled in it. The electric tape is about 14¢ per foot. Because 15 stainless steel conductors are woven into the tape, there is no need to run other electric wires. This product comes with a 5 year limited warranty. Long life, high strength and resiliency, low cost and easy maintenance are all reasons to consider this fence. Simple electrification gives superior control of animals inside and outside of the fence. Relatively poor visibility and risk of entanglement and injury must be considered when making decisions about installing this type of fence for horses. Closer post spacing, spacers, fence flags and/or electric tape all improve visibility for this product. Keeping the bottom wire higher off the ground, using fewer strands and depending on the electricity to do the actual control makes entanglement unlikely. High-tensile wire fence can cost 2¢ to 3¢ per foot of wire - 18¢ per foot for the recommended 6 lines (not including posts or electric supplies). This is very quick and easy to install. Visibility is good and it is easy for an animal to break away if it becomes entangled. It is useful for intensive grazing management to get the most feed from the pasture. This system is also excellent for temporary fences (portable corral) on trail rides. Cost is from 1¢ to 3¢ per foot of twine or tape. Electricity is a must, but do not use a weed burner charger. Sunlight will cause this material to need to be replaced within about 10 years. Rope creates a highly visible electric fence and the high breaking strength allows it to handle abuse. It does not require braced end posts and it's easy to hand knot. Round rope doesn't whip in the wind as much as electric ribbons, so post spacing can be wider. Depending on thickness and conductivity, rope generally costs 6¢ to 8¢ per foot. Excellent visibility at a much lower cost (21¢ per foot of rail) than four inch rail. Little to no bracing is required since lighter gauge wire is used with lower tensions. Rolling ground is easier to fence than with the 4" rail, and 20 foot post spacing is possible when using electric wire(s) with the rail. Ponyrail, with 14½ gauge Galfan coated wire, will last longer than the 12½ gauge galvanized wire in the 4 inch rail.